This technique is so simple! So easy that I could kick myself for not ’seeing’ it sooner! Its been staring at me in the face all along; still, better late than never huh! This technique involves using clear packaging tape or heavy duty masking tape to actually LIFT off the image and use it to make an impression or background. There was several ways you can apply the tape lifting technique. This tutorial will give you a run down through all of them. The first thing you need is Wide Clear Packaging Tape; you can use any size tape but I prefer to go for the widest as you can lift bigger images and your not as limited. Heavy Duty Masking Tape; you want the strong stuff not the low tack variety. I got some super duper sticky stuff from poundlands. Next you need Printed Papers to tape lift from; Newspapers are perfect for this because they are so thin. You can use book pages too from cheap paperbacks, I use the pages from books I get free on magazines for this purpose. Magazines are also ideal. You will also need Rubber Stamps of your choice and a good Black Permanent Dye Inkpad (for example memories). Lastly you need ordinary White Card to transfer your tape lifts onto; you can use any colour you wish, I just prefer to use white so I can add my own colour afterwards. Which Tape Is Best For Tape Lifting? You can work with either masking tape or clear packaging tape for all these techniques below, they are both ideal and both create very different effects. It depends on the overall look you are aiming for. Clear tape creates a more striking effect where the masking tape creates a very subtle muted effect. Try them both and compare. For the tape lift backgrounds you need either the masking tape or the clear tape, the directions are the same no matter what type of tape you opt for. The trick is to remove the tape without removing too much of the paper with it. If you practise this step you will get used to pressing and lifting the text and not the paper. Cheap quality papers work best for this I found like freebie magazine supplements, newspapers and free paperbacks. 2. 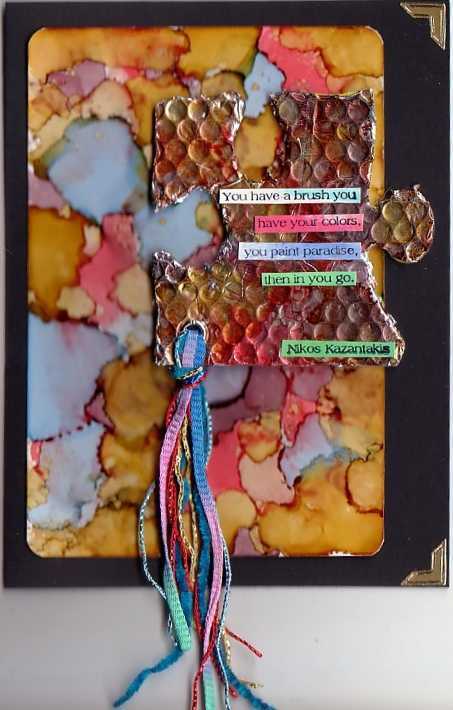 Continue tape lifting text from various papers until you have completely covered the surface area of your card. When sticking the tape on the card; arrange the tape lifts so that they are showing at all different angles and directions. Dont worry about completely covering the background with print, it is ok to have blank areas! You can add blank tape inbetween the prints so that there is no break in the texture of the background itself. As you can see from the above two scans that they are very different from one another! Talk about cool! As you can see from the samples above that the 2 different tapes create 2 very different and yet striking effects! Once youve made your backgrounds you can use them in your projects. This technique involves using the tape to actually lift the image from your rubber stamp! 1. Ink your rubber stamp with black dye ink and place it face up on your work surface. 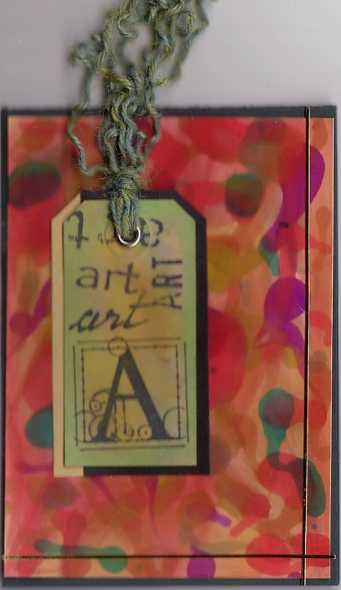 I used Memories brand, the stamp used is part of the Tim Holtz Stampers Anonymous line. 2. Tear off a strip of tape; either clear or masking, and place it sticky side down over the top of the inked rubber stamp. 3. Very gently, rub your finger across the surface of the tape to transfer the ink, the sticky surface of the tape ‘grabs’ at the ink and doesnt slide or slip. 4. Quickly lift off the tape and press the image (and the tape) down onto card stock. Your tape lift stamped image is now transfered and ready for colour! Note: Your tape lift stamped images will be a REVERSE image so dont use stamped images which rely too much on words (ie greetings) – if your using a word background stamp however the back to front lettering will give it a collagey feeling! 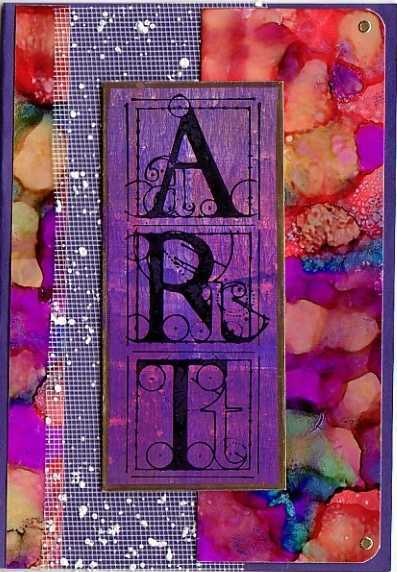 As before you can use alcohol inks with the clear tape or you can sponge on dye inks over the masking tape images. This technique is really exciting and I love lifting the images of the stamps! The quality of the prints on the clear tape are awesome, far better than on acetate as the tape doesnt slip! I hope you all enjoy playing with this technique and have as much fun with it as I did!If you have any questions or comments you can use the ‘add comments’ function below! A few readers have asked me about the Masking Tape Lifting Technique on the comments form and how it works as they cannot understand how it could possibly work as the masking tape isnt clear. I know masking tape isnt clear and it is opaque or rather cream in colour, but believe me the tape lift technique DOES work with it! Seems to me people have not actually TRIED it to see, just commented that they ‘dont think it will work’ …..
Just place the tape onto either newspaper or onto an inked stamp, lift it off again then stick the masking tape onto a sheet of card. The image WILL be visible – not as strongly as it would be with clear tape but it IS there – just very subtle and slight. It looks especially good on vintage style images as it makes them look distressed. 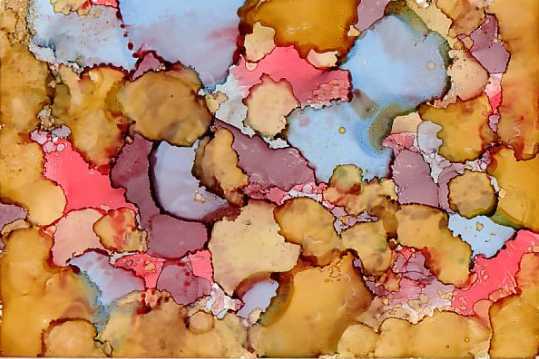 It’s no secret I love LOVE and ADORE my Alcohol Inks! The colours are out of this world! Recently Ranger brought out a whole new set of colours!! And I have to say these are yummy! So yummy I got ALL of the new sets! I got my set from Hearts In Touch so if you need any I recommend the service; Frances will look after you and she charges VERY reasonable shipping costs too which is an added bonus! 1. Take your sheet of gloss card and place it on a protected work surface – tip- I use a glossy magazine page to work on – if you get ink on the magazine paper you can actually use this for a background on cards! Waste not want not! 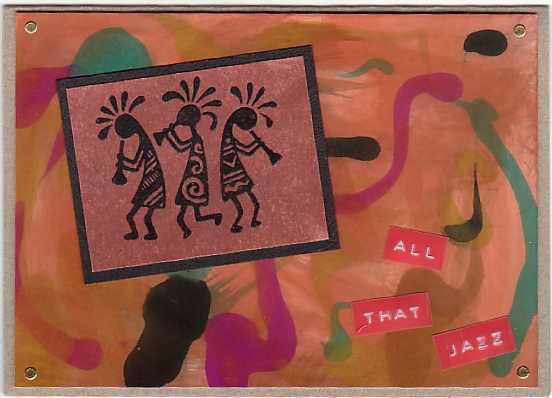 Ink Colours Used On Background Above are: Slate, Red Pepper, Stream and Wild Plum. 3. Allow the inks to settle and dry for a moment, take your pom pom and apply a dab of the blending solution to the pom pom (or cotton wool ball). 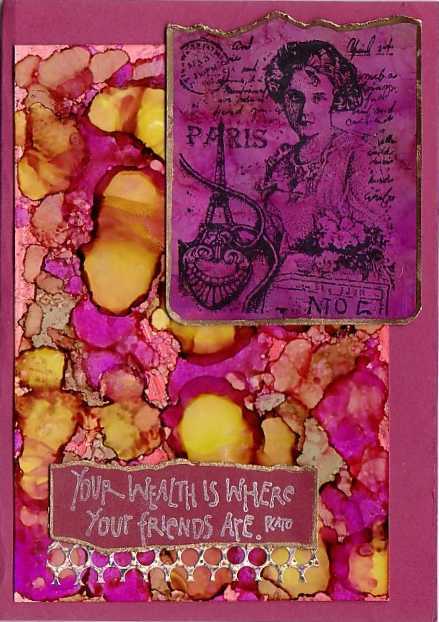 As always don’t forget to experiment using different colour combinations to achieve different effects. 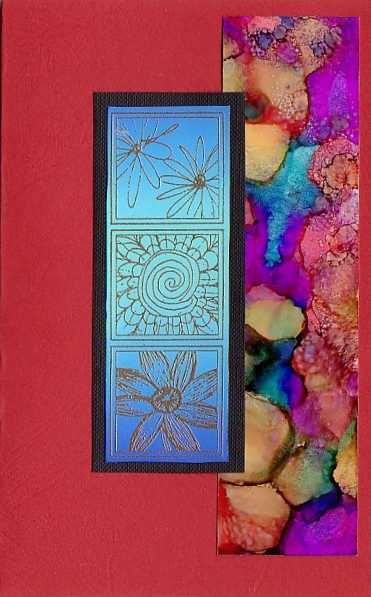 I created some of these backgrounds using ordinary gloss card and special high gloss photo paper used in inkjet printers – the difference in the colours on the 2 different varieties of card is STAGGERING! The photo gloss paper makes the inks hit you in the face!! Amazing! 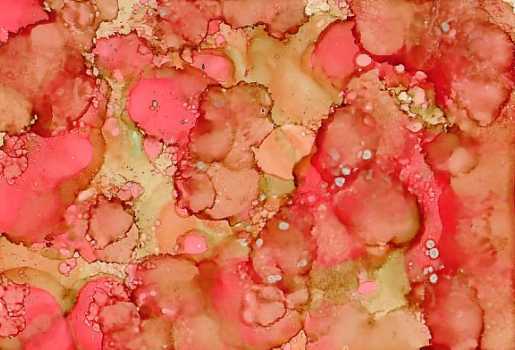 Im really enjoying playing around with the spray starch to see how it can be used, seeing how well it worked with the pearl ex I wondered how it would react with Alcohol Inks and decided to experiment and see. 1. 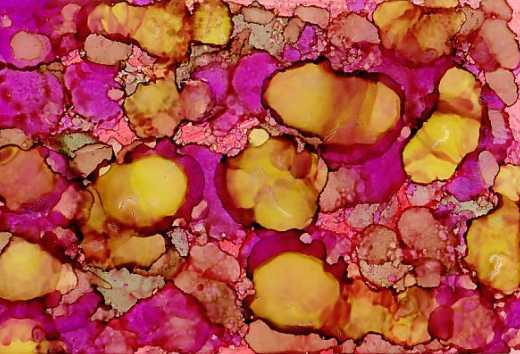 On a sheet of gloss card, randomly splash and dot alcohol inks all over. 2. 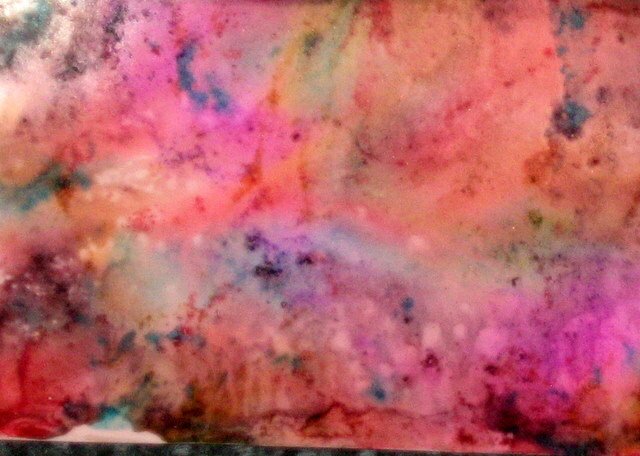 Spray over Alcohol Inks with Spray Starch. 3. 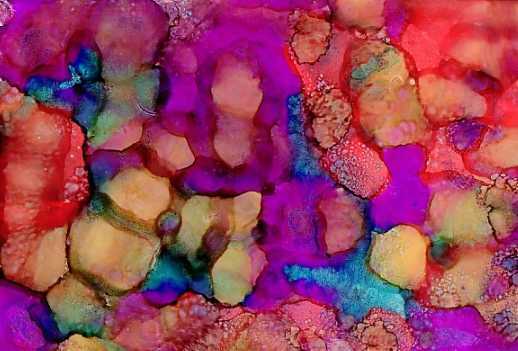 Add more Alcohol Inks. 5. Sandwich over the top with another sheet of gloss card and rub gently. The overall effect of these backgrounds reminds me of the Alcohol Inks and Floor Wax Background Technique I came up with a few years back. I recently signed up for a swap using alcohol inks, I dont know about you guys but I love my alcohol inks so much that Ive almost used all my blending solution up! I was too impatient to wait for an order of more to come in so I decided to improvise. I looked around my stash to see what I could find as an alternative. Yes I coulda used ordinary rubbing alcohol (or surgical spirit as we call it in the UK) but I didnt want to use that, I wanted something DIFFERENT. 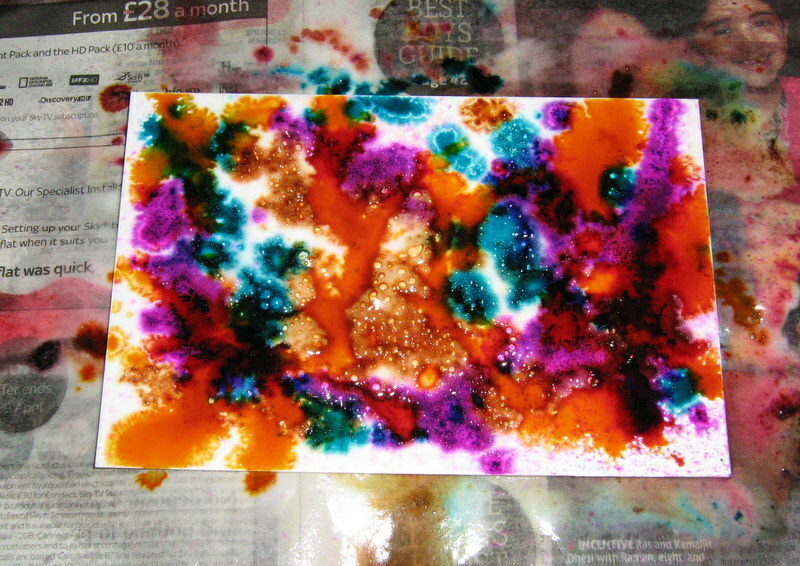 Then my eyes laid upon the half used bottle of floor wax I had and I heard the little voice inside me shout with glee – I hadnt tried alcohol inks with that yet! For these backgrounds I used ordinary floor wax, in the UK it goes under the brand of Johnsons Klear and can be bought in all the big supermarkets. Other side of the pond its known as Future Floor Finish. 1. Place the plastic wrap inside the plastic bowl to protect the bottom of the bowl as the inks will stain. 2. Pour a generous amount of floor wax in the container, you want just enough wax to cover the base of the container. 3. 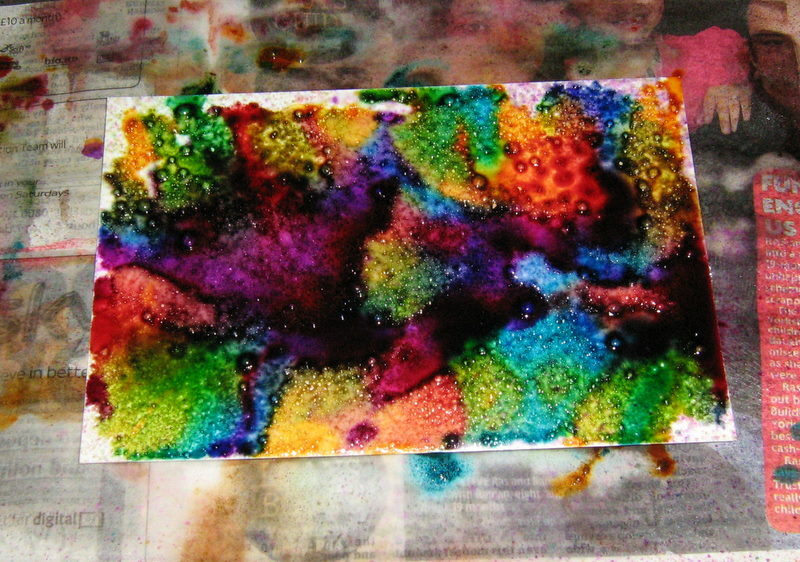 Next take your alcohol inks and gently drop ink from the bottles – you dont need a lot as the inks disperse in the wax. 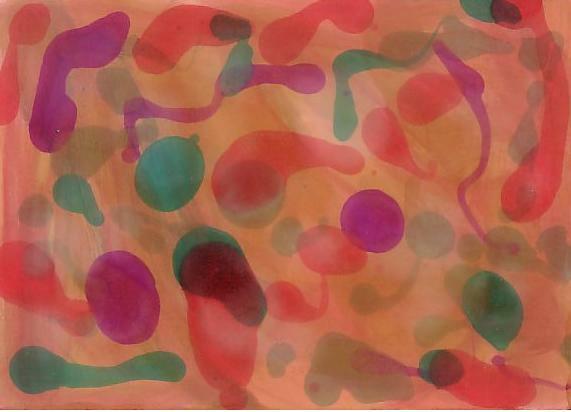 Do not completely cover the surface with ink, allow spaces inbetween drops so that the drops can blend together and create interesting patterns. I use approve 2-3 different colours for this. 4. 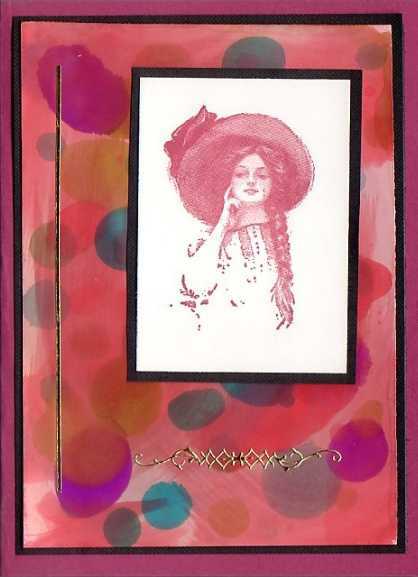 Take your gloss card and place over the inks, gently tap, then lift off, allow the inks and wax on your card to move around to create texture and movement. Then place on your newspaper to dry out. You can speed along the drying process with an heat gun if you prefer. 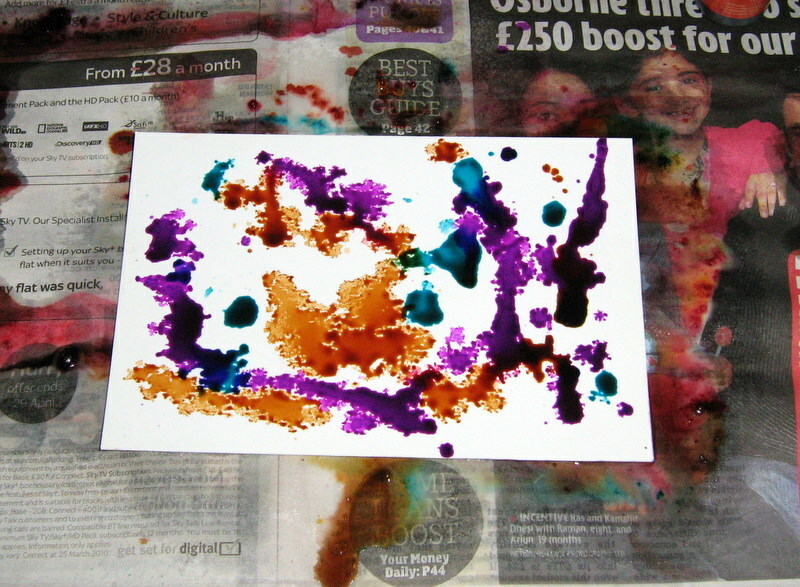 You can now place more card onto the ink and wax mix in the container to lift off more background colour. I keep doing this until there is no ink left. 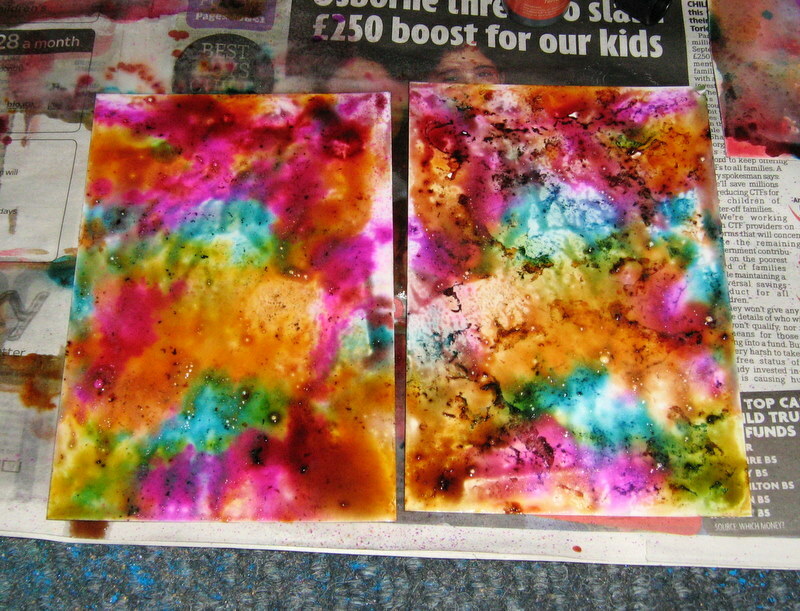 Then I add more wax and ink to replensish and make more backgrounds. 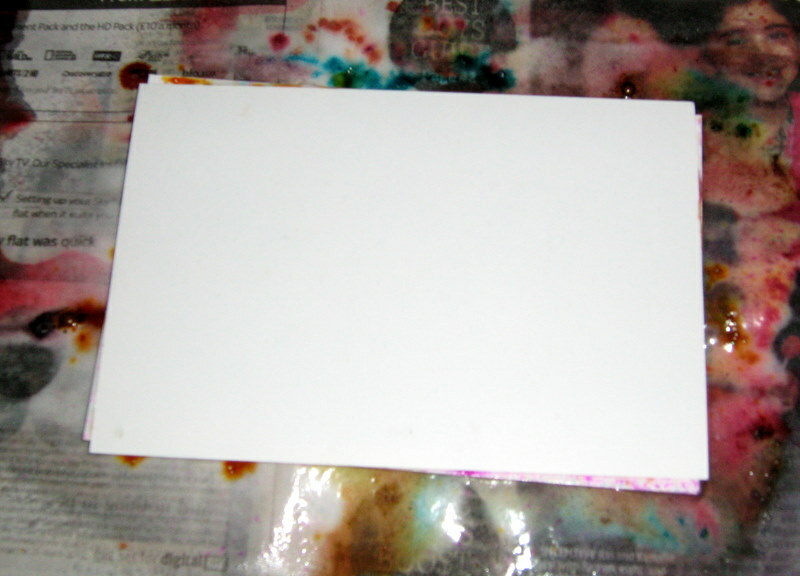 Once dry you can stamp and use your backgrounds in your artwork. 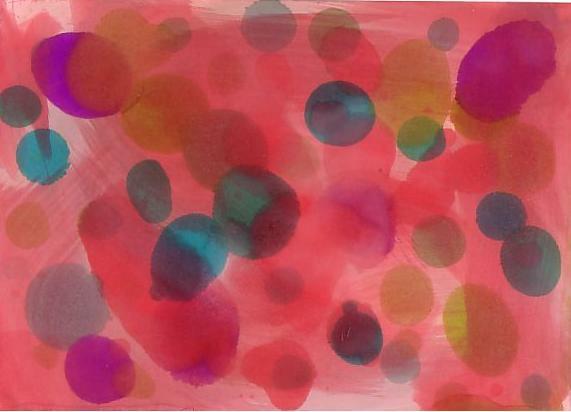 I find Brilliance inkpad works best when stamping on the waxy surface as it doesnt bubble like dye inks do. 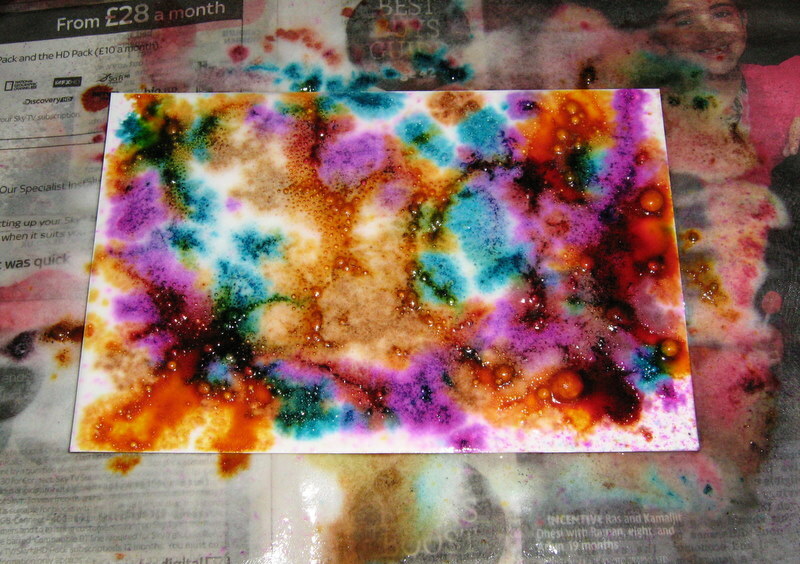 In addition to card stock you can use your alcohol inks on virtually ANY surface at all! I’ve not been experimenting with the inks for very long so haven’t actually managed to use them on many surfaces; but I have so far I have tried them on dominos, sea glass and acrylic pieces. The inks work perfect on all three! I’m going to play some more with these inks and let you know what other surfaces they work well on! So watch this space!! 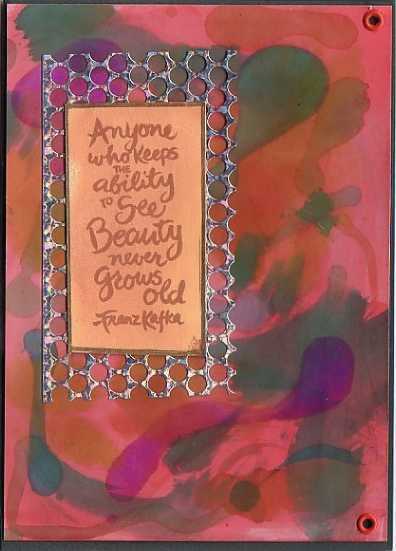 You can use alcohol inks on ordinary glass; but I didn’t have any glass in to experiment with. I did have some sea glass so decided to give it a try and see how the inks would work on that instead. I love how the inks react and look on sea glass; the glass has a rough texture and the inks literally sit in all the fine lines and grooves and this defines the texture of the glass; the overall effect looks amazing. 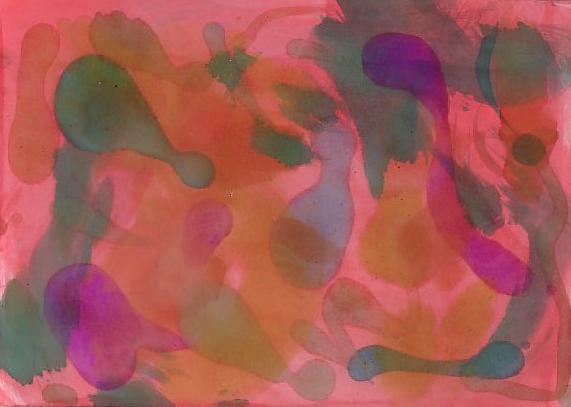 On both of the samples I used Butterscotch and Wild Plum inks, once the inks had dried I stamped over using a Stazon inkpad. Finally I sealed the inks and the stamped image with a very fine coat of Glossy Accents By Ranger. 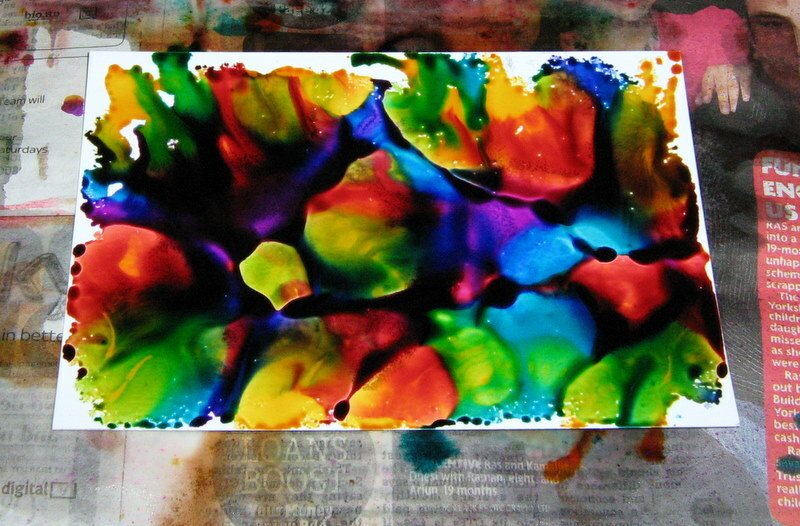 Alcohol inks were meant for dominos! 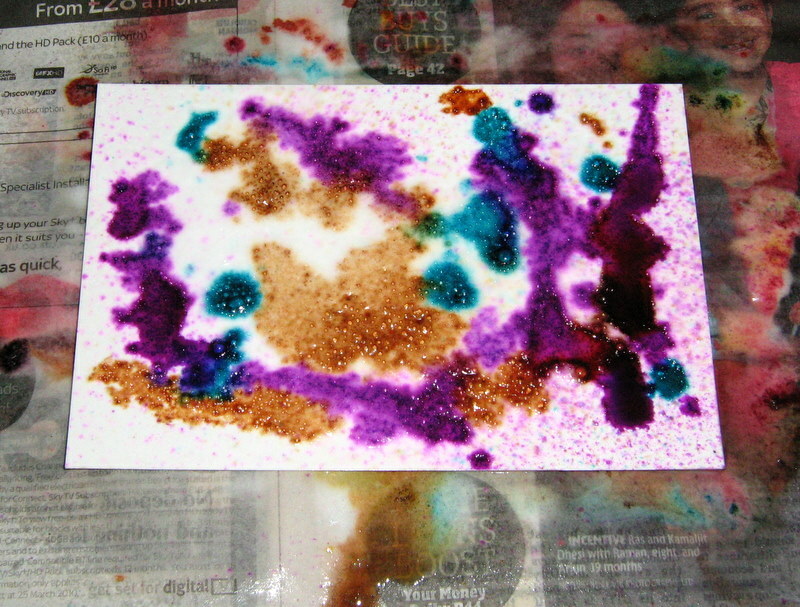 The sample on the far left was created using butterscotch, cranberry and wild plum inks on a domino. The domino sample below was created using Pesto and Butterscotch ink colours. I didn’t sand it or treat the dominos first; the ink was applied direct to the domino as I got it out of the box! Once the ink was dry I stamped my image with a stazon inkpad. Let dry. Next I highlighted the edges of the domino with a gold Krylon pen, let this dry. Then finally sealed the whole domino with a fine layer of Glossy Accents. And let it dry to finish. This is a blank acrylic key ring I had and wanted to use it with the inks to see what it would look like. 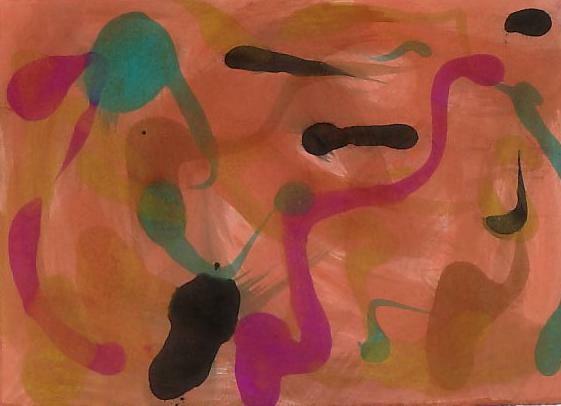 I added inks direct to the plastic – butterscotch and wild plum. Let the inks dry. Next I stamped onto the acrylic with black stazon inkpad and let that dry. Then I placed a piece of printed scrap book paper on the reverse of the acrylic piece and placed both into the key ring housing and clicked them into place to seal. The frame was highlighted using a gold Krylon pen.